There are many in our news media that portray the Tea Party Movement as a few disgruntled Patriots with nothing better to do then hold a few rallies and ruffle a few feathers along the way. At least that is the picture they keep painting for Americans. Let’s do our homework and find out more about the Tea Parties. In fact, let’s investigate the Tea parties. They aren’t a National Political Party! 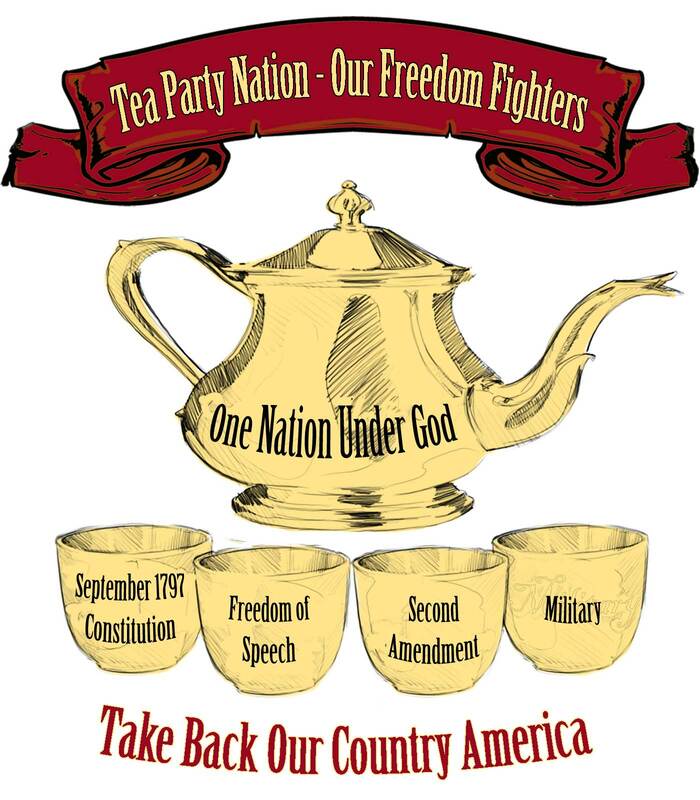 Millions of Americans are a part of the Tea Party Movement. Prerequisite for membership isn’t based on height or weight, color of skin, rich or poor, young or old or profession. It’s what’s in your heart, your morals, your love of Country and that burning desire to provide a safe haven for yourself, your children and grandchildren..
Basically, the Tea Parties are groups of like minded people who want to “take back their country,” restore our Nation’s once strong foundation and leave our children, grandchildren and future generations an awesome legacy that they can embrace with pride. Let’s talk about the history of our Nation and why we have gone from “One Nation Under God With Liberty and Justice for All,” to a country divided. This didn’t happen overnight and logic tells us we’re in a fight for our lives against the Meddlers, Peddlers and GOV. So sad, to think that America the Beautiful has been ravaged by the corrupt. As is so common in the past 20 plus years, the news media has devoured our lives with crap that is so far from the truth that it would take much more then a rocket scientist or Constitutionalist to dig thru the piles of rhetoric, propaganda and lies to define the real path our Nation has taken. Our Nation has strayed from the roadmap (our Constitution) given to us in 1787 and we’ve allowed the “meddlers, peddlers and Gov” to dice and slice our civil rights one tiny piece at a time. The meddlers are those who hid out in the swamps writing, rewriting and scheming; they are the ones who orchestrated the conspiracy to remove our rights, gain control of our Nation and brain wash our youth. At first this group of people stood on the sidelines casually chipping away at our freedoms, but now in 2011 they blatantly control of our news media, our schools, our privacy, our jobs and our Government. The peddlers are the ones sent out on special missions to spread propaganda, create distraction and insure that our troops (Americans) are kept divided or at bay. They are the ones who infiltrated our schools, removed control from teachers and parents, at the same time entirely changed our educational curriculum. The peddlers now live snuggly within the confines of 1,000s of talk radio, TV stations, Internet sites and many public service organizations. They’re everywhere, they’re everywhere! Their lives are devoted entirely to preparing a plate of false information via regurgitation, re-editing and propaganda in order to get a specific response from the viewer. The Gov, oh yes the question is where do I start – our Government as we know it now doesn’t resemble a Government of the people, by the people or for the people as stated in the Gettysburg Address “that this nation, under God, shall have a new birth of freedom — and that government of the people, by the people, for the people, shall not perish from the earth. Our Government with the assistance of the Supreme Court Judges has united with the meddlers and peddlers in an attempt to sabotage our beautiful Nation. Our Government of 2011 is pretty much a one party government inclusive of Republicans and Democrats. First, they demoralized our Nation via a method, which many refer to as political correctness and which I refer to as the “race and minority cards.” We literally bent over backwards trying to be all to all and lived in fear of offending our next door neighbor, co worker, the Unions, special interest groups and our Government. Secondly, they determinedly tried to remove God literally from our hearts and souls; they have lived under the false assumption that removing God from our schools, courthouses and government would pretty much be the end of God. But, they were wrong, dead wrong! So who is taking care of our children, our grandchildren and fellow Americans – could it be a predator, an intruder, and imposter or have we placed our Nation in the hands of a committed, honest, ethical Commander In Chief who will keep us out of harm’s way? None of us know the answers to that question with the exception of the puppeteers. Today, Jan 1st, 2011 we are sitting at home not quite as complacent as we were a few years ago, because it appears that our Commander In Chief isn’t leading our Nation, but dissecting it one piece at a time. Who is this person that many call “Mr. President? Where did he come from, where has he been all of our lives and what does he have to hide? Envision a parent or parents of 3 children ranging from 2 years on thru 18 years of age. Both parents are being shipped out to Afghanistan and they’re in desperate need of a full time mentor and or nanny for your children. After weeks, of searching they receive a call from a man who states he is the one, the only one who can care for your children. He says, “I am a great teacher, love children, an outstand administrator with all the qualifications that you require. Both parents are impressed with the telephone interview and they invite him into their home to meet the family. They insist that he brings references, job history, schooling and they inform him that an extensive background check will be next on the agenda! He arrived in designer clothes, clean shaven; nails manicured and proceeded to gain the confidence of each and everyone. He was humorous, an elegant conversationalist and one would almost think that his script had been written. He assured the parents that his background was impeccable and that he’d spent years working with young people in various community projects. Thus is the story that Americans lived during Obama’s Presidential campaign; they wanted to know his background, his work history, his education and all about his real friends, but that didn’t happen – many Americans were swept off their feet because he promised them “Changes,” and we were long overdue for some good news. Many Americans, including LTC Terrence Lakin are very apprehensive about our Commander In Chief. Citizens of the United States must assume the responsibility that our President isn’t an imposter and is dually and legally qualified to lead our Nation, direct our Military, deal with foreign companies and he or she will not under in circumstance place our Nation in harm’s way. Many depend entirely on the News media, not having time or possibly the desire to do their homework – instead their dependency rests on the news. Let’s take a quick peek at the what our news media says about Barack Obama and his citizenship. Starting back in 2008, catch up on the different news media that hits our airways – are we receiving facts based with solid information addressing both sides of the story or are we at the mercy of the “Big Dogs” who have turned journalism into a reality show? MSNBC is trying in every way possible to pretend that Obama’s citizenship questions have nothing to do with anything and once again MSNBC does their soft shoe theatrics saying it really doesn’t matter anyway, Obama has much more important things on his mind. Why wouldn’t they take this stance, in 2008 they refused to visit the vetting of Obama and created the news to fit the shoes of those leaning far, far left. Remember facts that include both sides of the story don’t exist at the home of this particular news station. But, MSNBC commentator Chris Matthews is becoming testy about Obama’s citizenship, because Chris will not tolerate playing gopher for anyone, including the Commander In Chief; Chris says Obama needs to do the right thing and put this to rest, otherwise Chris Matthews will be running around with egg on his face the rest of his life. NBC scrambles and plays hide n’ seek from the problems that Obama has with his inability or blatant refusal to provide us the information we seek. They concentrate on others like the “birthers, “ LTC Lakin, the tea parties in an effort to erase away public doubt about the Commander In Chief. NBC would rather fight then switch, so they’re content to take their old beaten up news which isn’t news and try to distract Americans and keep the troops divided. ABC has established itself as a media that loves to take on any right winged fight and provide any information necessary to sway the natives, including fictitious information, not fact based sprinkled with an overdose of propaganda. ABC may well go down in history as the news media that was relegated to the ancient history shelf due disgruntled viewers who no longer find them newsworthy. What a way to go!